Physical Therapy, as a profession, specializes in the rehabilitation of injuries and diseases involving the musculoskeletal and nervous systems. A wide variety of diagnoses are treated at our facility including orthopedic injuries, postoperative orthopedics, wounds and burns, and neurological problems including strokes, spinal cord and nerve injuries. 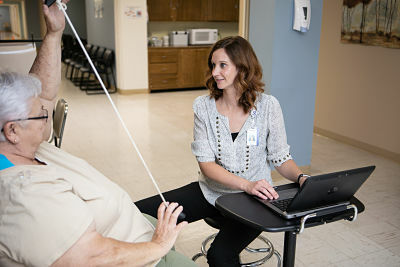 Our goal at Mitchell County Hospital Health Systems is to teach patients how to prevent and/or manage their condition so that they will achieve long-term benefits by regaining or improving the patient's normal level of function through pain control while healing and restoring movement and function. We will examine each individual and develop a plan, using treatment techniques to promote the ability to move, reduce pain, restore function, and prevent disability. At MCCHS, our Physical Therapy Department provides services to inpatients, outpatients as well as serving the resident care center and contracting with the Mitchell County Health Department for home health services. Our therapists have attended advanced continuing education and training and/or certification in a variety of areas. These include the evaluation and treatment of vestibular conditions as well as the LSVT BIG program for treatment of Parkinson's patients.